I’m Lewis Evans, aged 20, and I am a trainee arborist at Beechwood Trees and Landscapes Ltd.
Groundsman and trainee arborist roles, including rigging, dragging brash, plus tree climbing, pruning works and tree felling. 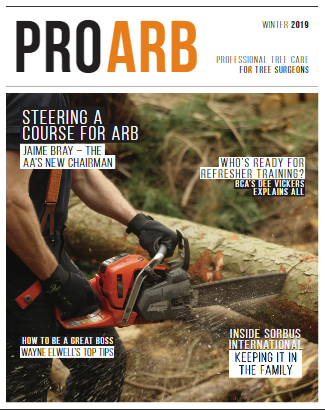 Why have you chosen arboriculture as your profession? I have always been keen to work outdoors and enjoy working within a team. It’s great having a job that changes from day to day, as I didn’t want to be stuck in an office from nine to five. Yes, I went to Warwickshire College in Leamington Spa where I studied a Level 2 Diploma in Applied Trees and Timber. I really enjoy climbing and I am keen to improve, there’s always something different and the job can be exhilarating. I enjoy using rigging equipment such as the hobbs lifting and friction device. It means we can cut bigger pieces of timber at once and can control and manipulate them. I am always looking to improve myself and my abilities. One day I would like to tackle larger tricky trees that require a lot of thought and judgement. Is there a structured development plan at your company for you? Yes, Beechwood is always looking to improve you and the qualifications you obtain whenever possible. Our skills are evaluated and new training is implemented to build us as arborists.